Would you like to make a real difference in the world? My guest Anita DeFranz was named by Newsweek as ‘One of the 150 Women Who Shake the World’ by French Magazine Le’Equipe as one of ’10 Women Who Changed Sport’ and The Sporting News as ‘One of The 100 Most Powerful People In Sport’. In 1976, Anita DeFrantz captained the U.S. women’s rowing team and won a bronze medal at the Montreal Olympic Games. Coming from a long tradition of fighting for equality and justice her story is an extremely fascinating and inspiring one. 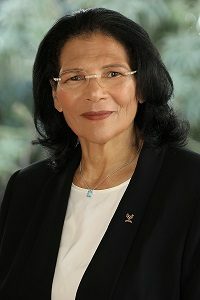 Anita, for example, amongst many other roles, is the first African-American and American woman to be a member of the International Olympic Committee and the IOC Executive Board. Having had the privilege to meet Anita,her amazing story and the lessons she shares will, I can assure you, benefit anyone wishing to make a positive impact on the world. Join me for this very special interview with Anita DeFrantz. ANITA DEFRANTZ is a member of the International Olympic Committee and the IOC Executive Board. She serves on the Juridical Commission of the IOC and on the Finance Commission. Before she joined the ranks of the IOC, DeFrantz captained the U.S. women’s rowing team and rowed in the eight that won a bronze medal at the 1976 Montreal Olympic Games. DeFrantz served as Vice President of the 1984 Los Angeles Olympic Organizing Committee and was elected to IOC membership in 1986, making her not only the first African-American but also the first American woman to serve on the committee. In 1987, DeFrantz began her 28-year role stewarding the legacy of 1984 LA Games as president of the LA84 Foundation. In 1992, she was named a member of the IOC Executive Board. In 1997, she became the organization’s first female vice president, a position she held until 2001. Currently, she is president of the Tubman Truth Corp., an organization working to provide liberty and justice for all people.